Hello friends! Happy Thanksgiving to everyone in the USA! I hope you are having a lovely time. It always sounded like a nice and meaningful holiday to me. I have spent some time to think about what I am grateful for today. 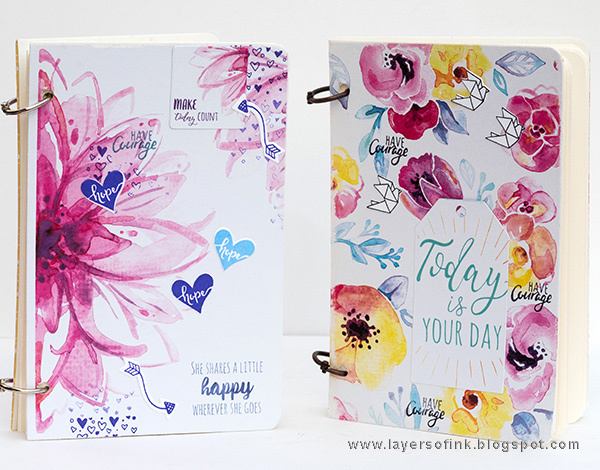 I have a tutorial on the Sizzix blog for two quick and easy notebooks. Ever since I was a child, I have loved notebooks of all kinds, and homemade ones are even more special since they are unique. You can make these for yourself, or as a gift for a friend. They would also work great as teacher or hostess gifts, and as Christmas stocking fillers. I used Planner Pages and More products by Katelyn Lizardi to make these. The papers in the Plan Your Day pad are so pretty, that each and every one could have been a notebook cover of its own. To see the steps for how I made these, and close-up photos, you'll have to head over to the Sizzix blog.